MPN is characterized by the somatic acquisition of a mutation in either JAK2 (JAK2V617F) or calreticulin in a hematopoietic stem cell. This mutant clone expands producing excessive numbers of mature myeloid cells. The clinical consequences of MPN are elevated peripheral blood counts, thrombosis, splenomegaly, debilitating constitutional symptoms, excessive inflammation, and transformation to acute leukemia. There is a critical need for novel therapeutic targets in MPN. Bone marrow transplantation is the only therapy that alters the natural history of the disease but the majority of patients with MPN are not candidates for this procedure due to age and comorbidities. JAK inhibitors are currently in development, but the impact of JAK as a target in MPN has been disappointing. Understanding the fundamental mechanisms by which the neoplastic clone is first established in MPN patients is necessary to develop therapeutics with curative intent. Our overarching research goal is to identify what drives the initial expansion of the neoplastic clone in MPN. We have developed a model in MPN whereby inflammatory insult upon a vulnerable hematopoietic stem cell pool drives the emergence of clones which have mutated in such a way to avoid these suppressive and/or apoptotic cues. This model is based on our findings that the JAK2 mutation endows resistance to the inflammatory cytokine TNF-alpha. The recent identification of calreticulin mutations in most MPN patients without JAK2V617F aligns nicely with this model. Calreticulin is an “eat me” signal on stressed cells allowing for their “clean and quick” phagocytosis by macrophages. 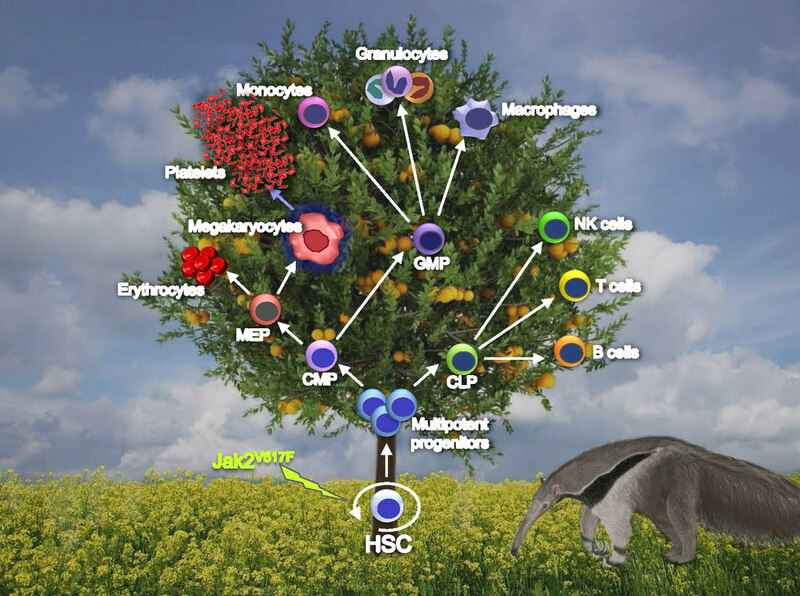 The hematopoietic stem cell (HSC) gives rise to all other blood cells. The JAK2V617F mutation arises in progenitor cells to initiate overexpansion of erythrocytes. The Jak2V617F mutation in megakaryocytes results in excessive platelet production. The bone marrow becomes increasingly fibrotic, resulting in reduced blood cell production and, eventually, bone marrow failure. MPN represents an excellent model disease in which to study the fundamental mechanisms of leukemogenesis because of its defined genetic lesions, chronic nature of the disease, and the ability to quantitatively measure the neoplastic clone over time. We hope that our work will not only lead to direct benefit for MPN patients, but will also lead to new therapies for other hematologic malignancies. 1. To identify what drives excessive inflammation in MPN. 2. To determine the role of lymphocytes in MPN pathogenisis. 3. To identify the role of mutated calreticulin in MPN pathogenesis.